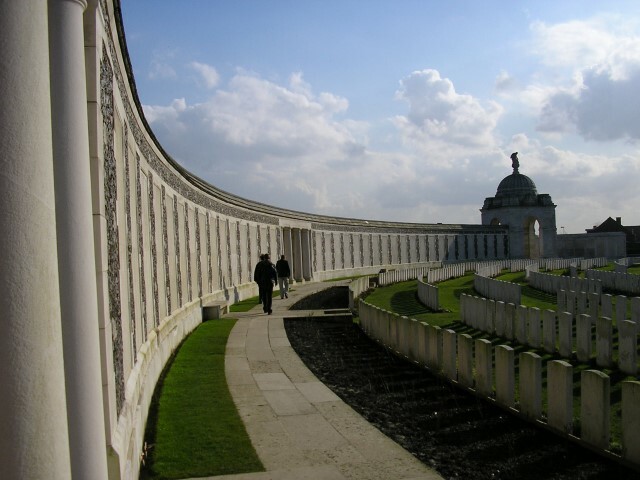 15644 Lance Corporal William Holmes, 1st Battalion, East Yorkshire Regiment was killed in action 25 April 1918 and is commemorated on the Tyne Cot Memorial, Belgium. He was about 29 years old and is commemorated on the Cockfield War Memorial. William Holmes enlisted at Deaf Hill into the East Yorkshire Regiment and was allocated the regimental number 9/5644. 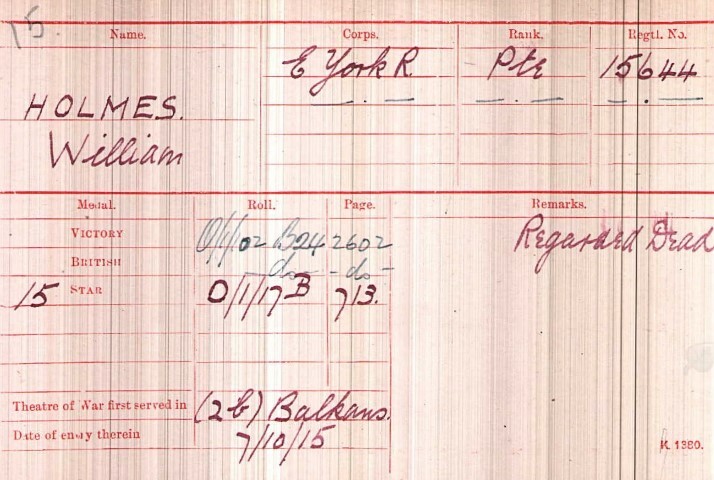 The service details of William Holmes have not been researched however it is known that he entered the Balkans 7 October 1915. The only East Yorkshire Regiment to serve in the Balkans was the 6th (Service) Battalion. This battalion was formed at Beverley in August 1914 as part of K1, Kitchener’s New Army and came under the orders of 32nd Brigade, 11th (Northern) Division. In December 1914 it became the Pioneer Battalion to the Division. In July 1915, it sailed from Avonmouth via Mudros to Gallipoli and landed at Suvla Bay 7 August 1915. Private W. Holmes was a later draft and the battalion was stationed in the Suvla Bay area. The evacuation of Gallipoli took place in December 1915 with the last troops departing in January 1916. The Division withdrew 19/20 December. Between 7 August and 31 December 1915, the 6/East Yorkshire Regiment lost 12 officers and 238 other ranks while serving in Gallipoli. The battalion spent some time on the island of Imbros before moving to Egypt, 2 February 1916. The Division received orders in June 1916 to move to France and the Western Front. 10 July 1916 it landed at Marseilles. Private W. Holmes was transferred from 6/EYR to 1/EYR in a draft of 30 men which arrived 10 March 1916 which is some time before the main landing of the Battalion at Marsailles. At that time he was a Private and the date when he was promoted to Lance Corporal is unknown. 64th Machine Gun Company joined March 1916 and left to move into 21st MG Battalion February 1918. There can be no doubt that Lance Corporal W. Holmes was a “seasoned veteran” of the Western Front. The First Battle of Kemmel: 17 – 19 April 1918. The Second Battle of Kemmel: 25 and 26 April 1918. 25 April 1918: at 2.30am over 250 batteries of German guns opened up on Allied positions with a mixture of gas and high explosives. For 2 hours they concentrated on destroying Allied gun emplacements. At 5.00am the German barrage was switched to the French front line. At 6.00am the German infantry launched its attack, by 7.10am Kemmel Hill was in enemy hands and by 10.30 it was all over. Allied troops consisting of British and French Brigades were brought forward to hold the line and that evening a further British Division arrived and were placed under French command to attempt, with the French, to seize back Kemmel but to no avail. The position would remain in German hands until the end of August when the British 34th Division and the American 27th Division drove the enemy from the area. April 25th: In the Line. About 2.30 am the enemy opened a heavy bombardment with gas shells which continued for about 1-2 hours. Intermittent shelling continued until about 5am and then a very heavy barrage was put down on all the valleys and possible assembly positions in the rear of the front line defences. The enemy then attacked under a smoke barrage and was greatly assisted by fog. After 2.30am all communication with BHQ from coys ceased, telephone lines broke down and repeated attempts to get runners through failed although touch was maintained with the front line coys of the left & right battalions for two hours after. No news whatsoever came from the front coys but about 7am small parties of Germans wandered over the BLACK COT RIDGE and into the e.side of GRAND BOIS. BHQ was then organised into two parties, each about 12 strong and a stand was made around BHQ for nearly two hours and the enemy sniped as he appeared over the ridge. By 8.30am the enemy had established machine gun posts on the ridge and was advancing in strength (in snake formation) down the ravines from PETIT BOIS & BOIS DE WYTSCHAETE. The party around BHQ was by this time obliged to withdraw and during the withdrawal came under heavy machine gun fire, the CO, Major J.H. COLES was killed. Only three officers and 30 OR succeeded in getting there. (No details reached the battalion headquarters) but from information gathered from one or two men who had succeeded in getting away from the front line coys, the enemy succeeded in enveloping the front line coys under the cover of his smoke barrage. 2 L/T S.W. HOWARD, A/ADJT. 2/LT.A.D. ROBINSON OC D. Coy and the MO CAPT.R.T. RAINE got safely through the barrage. The two former reported at nucleus camp DEVONSHIRE CAMP, CUDERON during the afternoon. 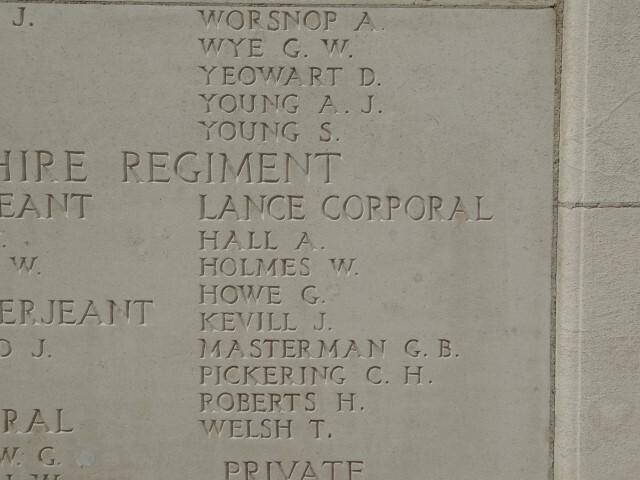 Later research records that between 25 and 30 April 1918, 1/East Yorkshire Regiment lost 78 other ranks killed in action or died of wounds including Lance Corporal W. Holmes. He has no known grave and would have been recorded as “missing” then regarded as dead due to the length of time elapsed. 30642 Private T.W. Cross, 1/EYR was killed in action on the same day and he is also commemorated on the Tyne Cot Memorial and Copley War Memorial. 1911 census Note: It should be noted that this William Holmes is the only person with any connection to the village of Cockfield that has been traced and it is suggested that this is the correct person. There is no W. Holmes commemorated on the West Auckland or St. Helen’s Colliery War Memorials – it is assumed that the family moved to Cockfield after 1911.